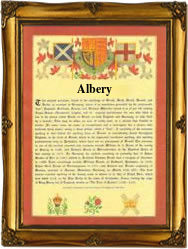 This ancient name recorded as Albury, Albery and Albro, is of Anglo-Saxon origin, and is a locational surname deriving from any one of the places called Albury in Hertfordshire, Oxfordshire and Surrey. These places are all recorded in the Domesday Book of 1086 as "Eldeberie", "Aldeberie" and "Ealdeburi" respectively, and all share the same meaning and derivation, which is "the old town, fortified place", from the Olde English pre 7th Century "eald", old, with "burg, burh", fort, town, often referring to a Roman or other pre-English fort. Locational surnames were acquired by local landowners, and the lord of the manor, and especially by those former inhabitants of a place who had moved to another area, usually in search of work, and were thereafter best identified by the name of their birthplace. Recordings of the name from Surrey Church Registers include the christening of Jyllian Alburye at East Clandon, on October 21st 1562, and the marriage of William Albury and Joan Evans on September 21st 1606, at Kingston upon Thames. The first recorded spelling of the family name is shown to be that of Stephen de Aldebury, which was dated 1273, in the "Hundred Rolls of Oxfordshire", during the reign of King Edward 1, known as "The Hammer of the Scots", 1272 - 1307. Surnames became necessary when governments introduced personal taxation. In England this was known as Poll Tax. Throughout the centuries, surnames in every country have continued to "develop" often leading to astonishing variants of the original spelling.